Style 3733 is the common plain open weave "boat and tooling" 6 oz/sq yd fiberglass cloth. 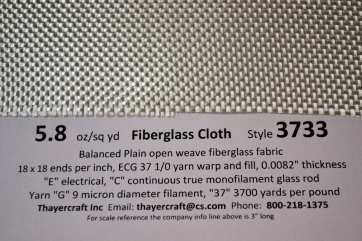 There are two 6 ounce fiberglass cloth style very similar with the other being 7533. 7533 only differs by having twist in the yarn with 3733 sometimes being referred to as the "flat" weave with 7533 as the "twist" weave. Melbourne Florida that like the 497A also and 497A is not really touted as a surfboard finish. We have other finishes on the 3733 like the 627 which is a universal finish also but not quite as soft as the 497A though it can vary, though slightly, from roll to roll. The absolute softest finish, as mentioned in many of the other cloth descriptions is the 504 Volan, but of course Volan has a greenish tint from the Chrome complex it uses. What you're buying here is just the 3733 with the clear Silane 497A finish. This finish is good for Epoxy, Polyester as well as Vinyl Ester resins.